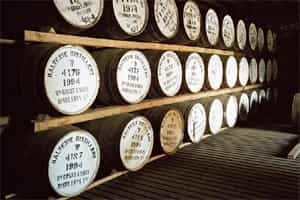 Single malt whisky, wherever in the world it is produced, is made of just three ingredients—water, malted barley and yeast. 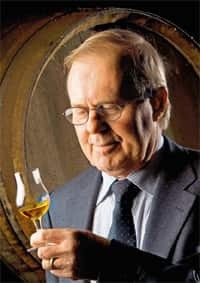 The spirit that is produced is then matured, usually for a minimum of three years, in oak barrels before being bottled. Water is used at every stage of production, through the malting, mashing, fermentation, distillation and maturation processes. Each distillery will pride itself on its water source and constantly monitor the quality. Many distilleries were built in specific locations because of the quality of the nearby water source, which may be a spring, well, stream or loch (small local lake). The majority of the barley used in making single malts worldwide is grown in Scotland. Only certain varieties of barley are considered to have a sugar yield high enough to use in whisky-making, with new varieties being constantly engineered to help improve this area of production. Yeast is a microorganism that converts sugars from the barley into alcohol and carbon dioxide. Step by step: The various processes in the making of a single malt. 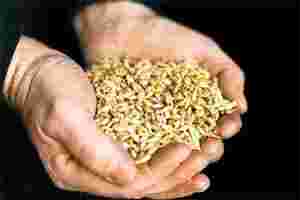 Barley is steeped in water and slowly dried, recreating the warm and moist conditions in which it would grow naturally. The barley must break down its starch content into sugars to use as energy in order to grow. Before this energy is used in growth, the barley is “killed" by drying it out in order to capture the sugar content in each kernel. If peat smoke is used to dry the barley, the resulting spirit and matured whisky will carry a smoky, earthy flavour to it. The process of using yeast to convert the sugars in the wort to alcohol is known as “fermentation". This takes place in large vats called “washbacks", often made of pine or stainless steel; the largest in Scotland holds just under 70,000 litres. Firstly, the wort is cooled, otherwise the heat will kill the yeast. Once the yeast is added, the sugars are converted into alcohol and carbon dioxide over a fermentation period of around two days. The carbon dioxide is extracted and either recycled or disposed. The result is a strong, beer-like liquid, known as “wash", which is around 8% alcohol. 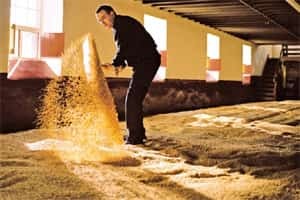 At this stage, each distillery will have its own unique wash, with the flavour profile depending very much upon variables such as the water used, the type of barley grown, the substance used to dry the barley, the length of mashing and fermentation. The first still is known as the “wash still". Alcohol evaporates at a lower temperature than water, so heating the stills to just below 100 degrees centigrade will cause the alcohol to separate from the water and rise as steam. 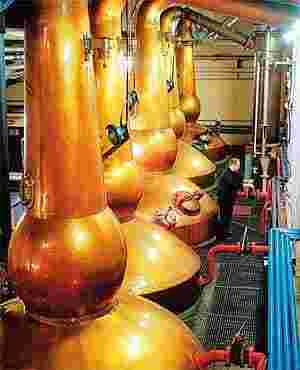 Once the alcohol hits the colder, upper area of the copper stills, some of the steam will condense naturally, running back down the inside of the still, picking up elements of copper as it goes. Some of the steam will carry on out of the still to a condenser where it is cooled and turned back into a liquid. The liquid that evaporates from the wash still is known as “low wines" and is transferred to a second, smaller still known as a “spirit still" for the same distillation process to happen again. Typically done twice (double distillation), but occasionally done three times (triple distillation), this final step produces a strong, clear spirit called “new make", which is around 70% alcohol. The size and shape of the stills play a major role in the flavour of the new make produced by the distillery. Some harmful alcohols are also produced during the distillation so only the middle of the spirit run from the second still is taken away for maturation. 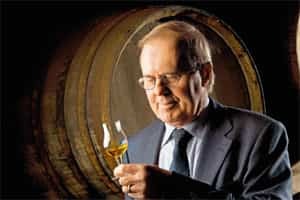 In Scotland, second-hand oak casks are used, which give flavour to the spirit from the previous contents of the cask (sherry, bourbon whiskey, etc.) and allow for the maturation period to be longer than in other sectors, as the influence of the wood will be lower due to its previous use.